This year my daughter entered the fifth grade. She didn't need a new backpack or lunch bag because she was quite content using the ones from the previous year. (That's my girl). 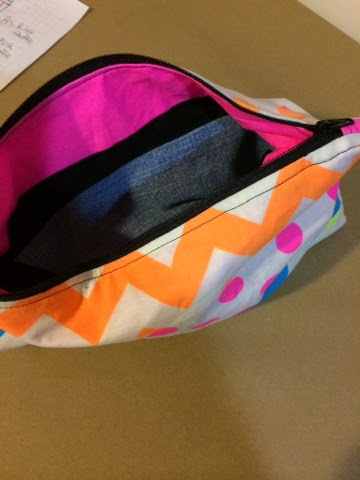 However she did ask me to make her a large pencil pouch. Of course I said sure. 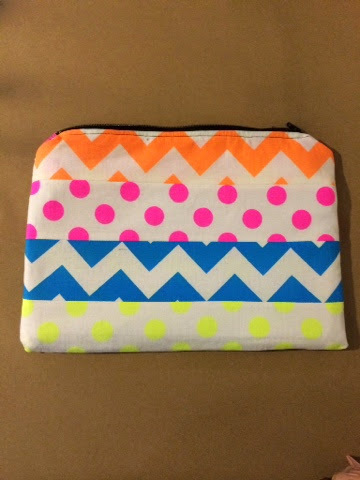 What surprised me was when she asked for it to be neon! And boy was it ever loud! Lots of bolt prints and colors. For a few hours the 80's were definitely back! Thankfully they quickly found a place in my daughters backpack because I've been there done that! 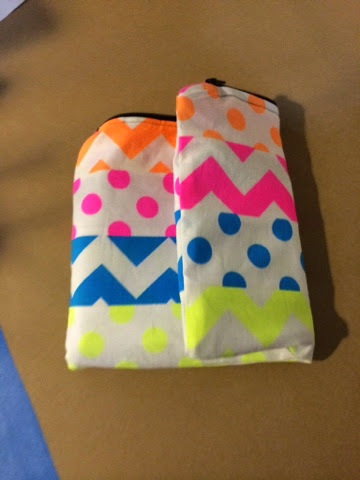 I used a Riley Blake neon collection role polie for the outside and some old demin for a nice, sturdy lining. I am big on up-cycling Demin for projects like this. They really provide the sturdiness and durability you need for a bag like this. The last thing I wanted was for pencils to poke through the inside. My parents are huge NASCAR fans. They have a camper and go to several races a year along the east coast. 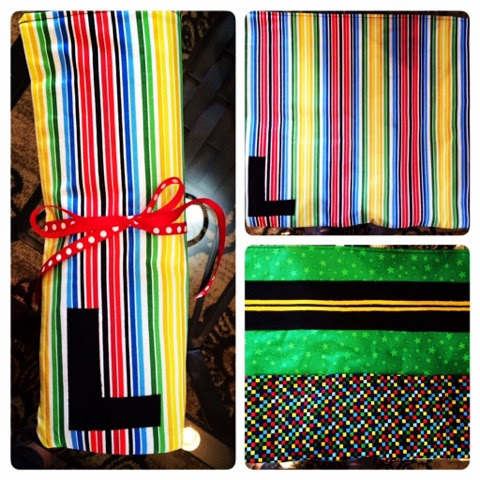 This year for my moms birthday I decided to make her a small table runner for the campers kitchen table. 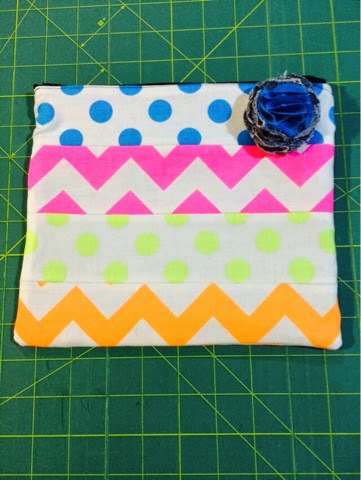 I used the jelly roll pattern from this jelly roll quilt along blog. The only thing I changed was to use only five strips. 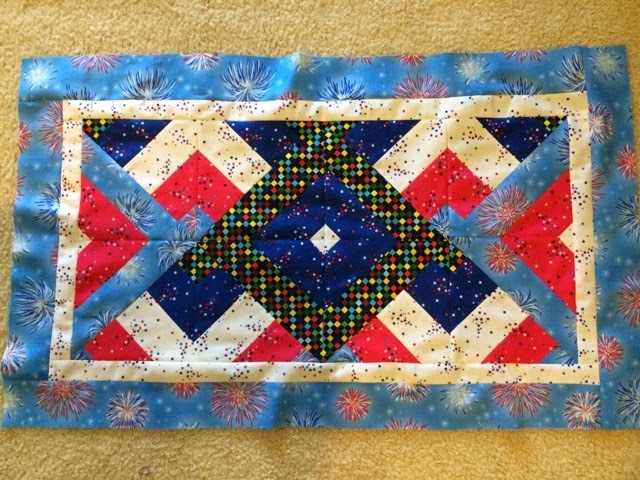 The stars and firework fabric is from A Nation's Song collection and the checkered fabric is from the 2014 Thomas the Train line. 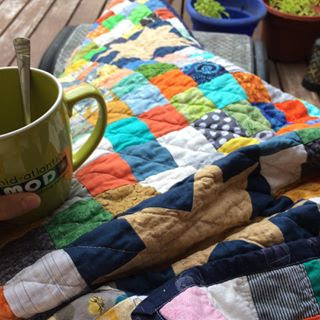 Both are from Quilting Treasures. I really like the checkered fabric because it reminded me of the checker flag and when it all came together I felt it looked like a racetrack. This sort of happened by accident but really came together nicely. I only did two sets of jelly roll strips matching two in the center and pointing the other two on the outside facing in. I added two rows of borders and finished it off with a red binding. Needless to say my mom loved it and currently displays it proudly on the dining room table. It will make it to the camper in the Spring when the racing begins! 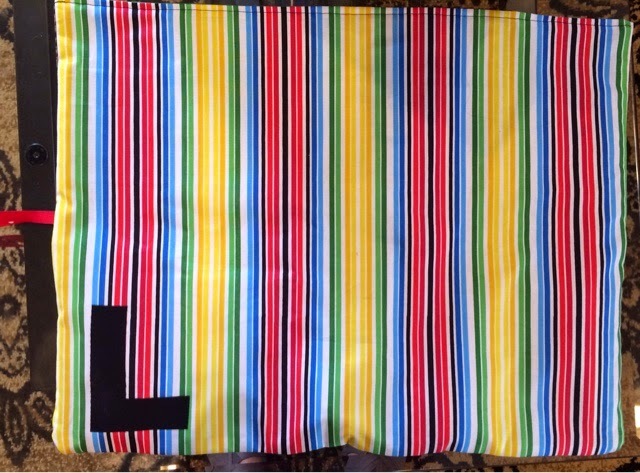 The table runner top. I'll take a photo of the finish product next time I visit. Amongst my passions in life I hold music very near and dear to my heart. I am thrilled to share that passion with my daughter. Recently she had the honor of taking an after-school singer-songwriter club. Throughout the five months thee group collaborated and wrote songs. They presented their songs on a few Friday's ago as a group in a coffeehouse type setting in the lobby of their school. Their teacher, Ryan Peters, who is an accomplished singer/songwriter himself lead the group to an impressive level! 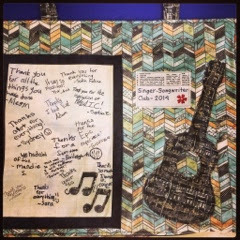 To thank this wonderful teacher for his hard work in creating the club and being a true inspiration and role model for the students, I designed a music themed wall hanging and had all the kids sign it. I used Basic Grey's Sweet Serenade collection for Moda. I appliqued a guitar and used the fun label prints by Sweetwater with the definition of "original." I also framed a piece of Bella solids fig tree cream with black borders to allow for a place for the kids to sign. Here is the song my daughter wrote and sung about the importance of friends! It's amazing what touching lyrics this group of fourth and fifth graders wrote! If you'd like to read more about the event please check out this article in the East Penn Press. They have recorded CD's to sell over the next few weeks with all the proceeds going to charity. What a wonderful way to see the music of these children benefit so many people. I always think homemade gifts are the most fun to give. When our neighbor invited us for her sons birthday I new just the right present to make. He loved cars and most importantly he loved matbox cars and racing them around them anywhere he could. I used some Thomas the Train fabric from Quilting Treasures and made him a car holder that when unrolled became a race track. It has 6 wide 2.5 inch slots for the cars and a ribbon to tie it all together. I even personalized it with his initial. It was perfect for this little guy who was turning two. His mom said it was great to bring along for long car rides and playdates too. I couldn't agree more!